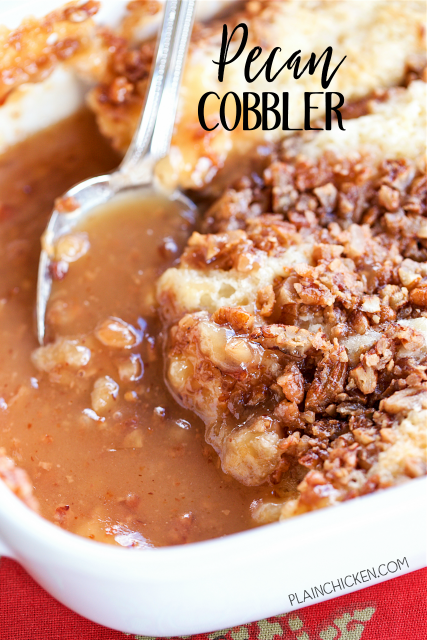 Pecan Cobbler - THE BEST dessert ever! Magically makes an amazing sauce as it bakes. Butter, flour, sugar, milk, vanilla, pecans, toffee bits and boiling water. Serve with vanilla ice cream or fresh whipped cream. Perfect for the holidays! This is hands down one of the best desserts I've ever made. I had zero self control around this Pecan Cobbler. I could have just drank all that yummy sauce in the bottom of the pan. AMAZING!! It is 100% going to be on our Thanksgiving and Christmas table! This dessert is best served warm right out of the oven. Thankfully it only takes a couple of minutes to make. It takes less than an hour from start to finish. Perfect to throw in the oven after the holiday meal. Everyone should be ready for dessert by the time the cobbler comes out of the oven. 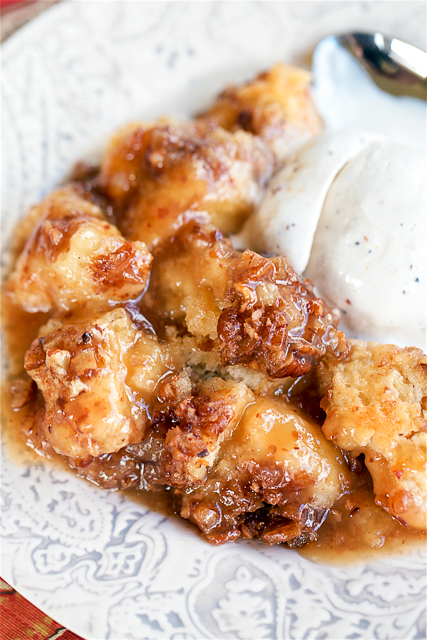 We served this Pecan Cobbler with some vanilla ice cream, but it would also be great with some fresh whipped cream. Either way, this will taste fantastic! I promise! In a medium bowl whisk together 3/4 cup sugar, flour, baking powder, salt, milk and vanilla. Pour melted butter into an 8x8-inch pan. Pour batter over melted butter. In a separate bowl, combine the remaining 1 cup of sugar, the pecans, and toffee bits; sprinkle evenly over the batter. Slowly pour boiling water over top of the cobbler. Bake 40 to 45 minutes, until top of the cobbler looks set. It really is creepy how your tastes track with mine. This has been on my bucket list since I visited Dallas a few years ago. This looks AMAZING! Can't wait to try it! I am going to make this for Thanksgiving as it looks so good. However, where do you get toffee bits - I tried 2 stores today and couldn't find them. Thanks! Walmart, Target and Publix carry them. They are the Heath bar bites. Can you double the recipe and use a 9x13 pan? I'm thinking 8x8 will just not be enough! I don’t see why not. Enjoy! Have you ever made this in advance and then rewarmed it? I wonder how it would hold up? I haven't tried reheating this. I usually just serve it hot out of the oven. You can certainly give it a try. I can't imagine it would taste bad.